I made this for Jon’s birthday the other year, and it was a huge hit. I mean, everything is better when it’s giant-sized right? One of his favourite flavours is choc chip cookie dough, and when he was a kid, he had an ice-cream cake every birthday. So this was a really fun way to bring that all together. It was also a lot of fun to make! Some recipes you enjoy making, some are a lot of work. This is both, but honestly, there’s just something about mashing up ice-cream that makes you feel like a big kid! When I make this again, I’m keen to add some peppermint, another huge favourite of Jon’s. Choc mint ice-cream never lasts long around here. Beat the butter and sugars on medium for 1 minute. Add the vanilla and water, and beat until combined. Slowly add the flour to the mixture. Add the chocolate chips and stir until blended. Knead gently on your workbench to combine. Flatten it out into a rectangle, wrap in plastic wrap and freeze for 20 minutes. Remove the vanilla ice-cream from the freezer and allow it to soften for 10 minutes. 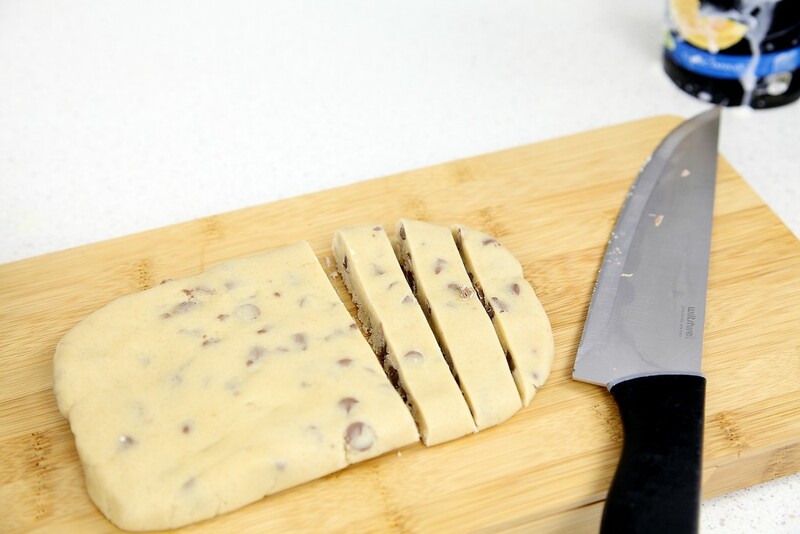 Chop up the cold cookie dough into 3/4" chunks. 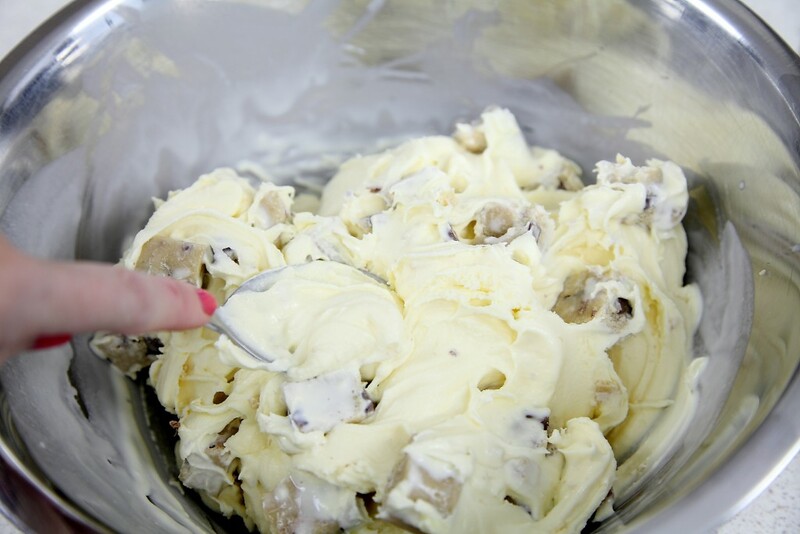 Place the ice-cream and cookie dough chunks in a stainless steel bowl and stir to combine. Take a brownie tin (we used a 6" x 10") lined with plastic wrap, and press the ice-cream into it. Wrap it tightly and store in the freezer until assembly. Beat the softened butter and sugar for 1-2 minutes until fluffy. Add the egg and vanilla extract and beat to combine. Once it has combined, knead gently on your workbench into a ball. Wrap in plastic wrap and refrigerate for at least 2 hours. Preheat oven to 175°C/ 350°F degrees. 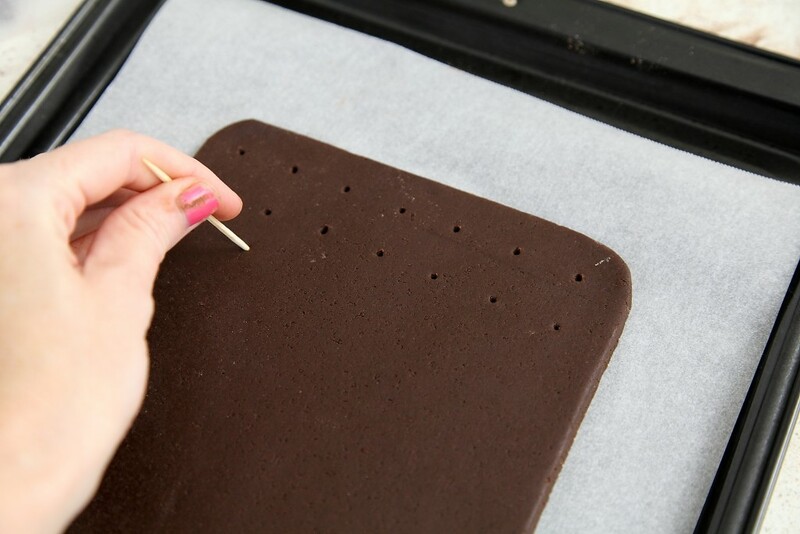 Cut a template of the base of your brownie tin using parchment/ baking paper. Go too big rather than too small, as the cookie tends to shrink rather than expand. 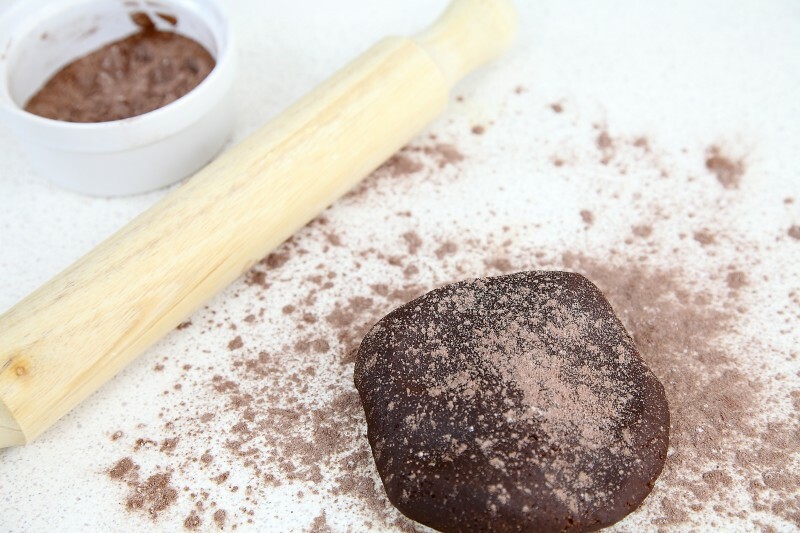 Roll out your cookie dough to 3/16" (4mm) thick, using half cocoa, and half flour, so it doesn't stick to your workbench. Cut out two cookies in total. Prick holes on the tops of the cookies, place on a baking sheet lined with baking paper, and bake for 16-17 minutes, or until it looks well crusted over. Move it to a cooling rack, and allow to cool completely prior to assembly. If you are not serving the sandwich immediately, wrap sandwich cookies in plastic wrap, or place in an air tight container. 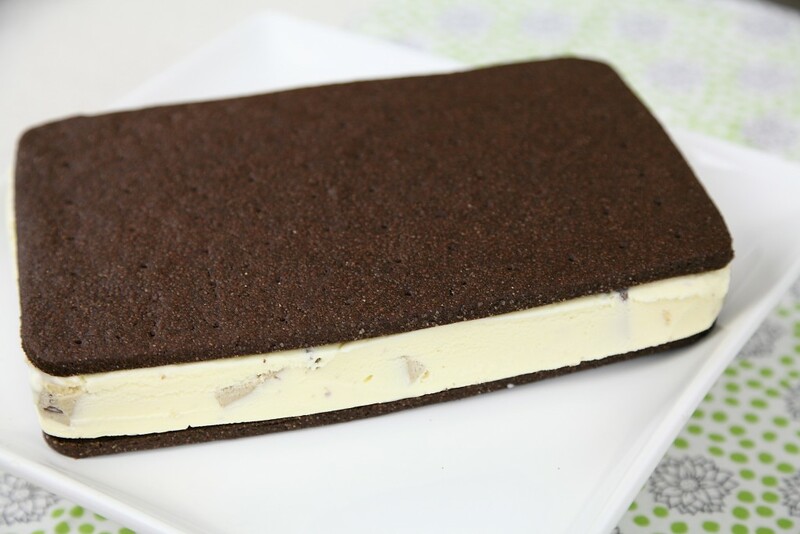 To assemble, simply remove the ice cream from the freezer, and sandwich between the two large chocolate cookies. Trim any excess ice-cream hanging over with a sharp knife. Serve immediately.